And, accordingly, what is “the wealth of nations”? Through time the meaning of these terms has changed and continues to change and mutate so that today we stand at the threshold of what is known as ‘the knowledge-based economy’. How did we get here? What force is propelling us into a future where science fiction becomes ‘economic’ reality? First, over time our concept of what constitutes ‘wealth’ or alternatively “property”, has mutated from physical things and persons to increasingly intangible things and processes, especially the expectation of profit from business transactions including those most intangible forms of wealth – intellectual property (please see: J.R. Commons, The Legal Foundations of Capitalism, p. 274). In this regard it should be noted that econometrics is the sub-discipline of economics explicitly concerned with quantitative measurement including that of national income and its causal agents. Other sub-disciplines play different roles. For example, institutional and cultural economics are primarily concerned with the ‘qualitative’ nature of such agents as well as their emergent outcome - national income. In reality, one can not measure what one cannot name. The history of national income as well as business accounting is rife with examples of ‘new’ or ‘creative’ entries being ‘discovered’ then added to the asset and liability statements of the balance sheet, e.g. ‘goodwill’ as well as new items to the revenue and expenditure statements, e.g. intellectual property royalties. Second, over time our concept of the source of wealth has mutated and changed time. 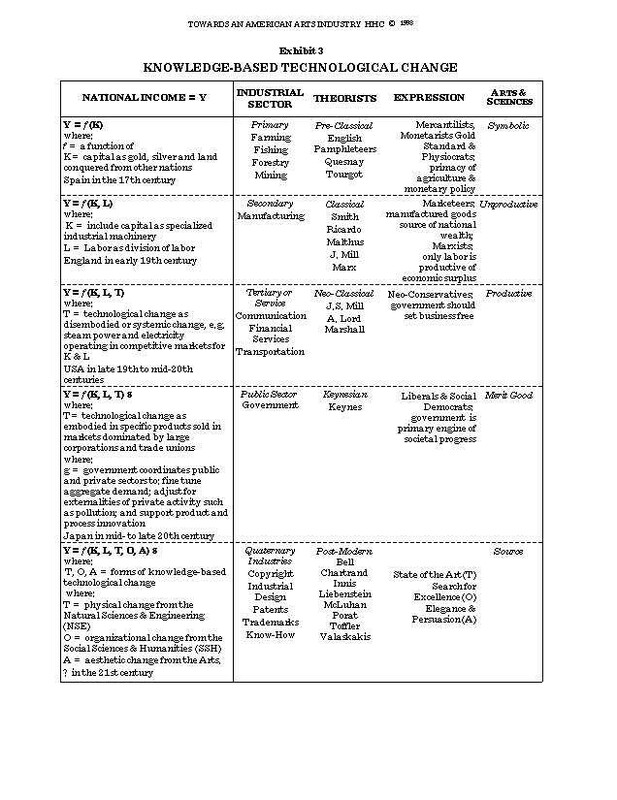 Collectively called ‘factors of production’, these are the causal agents of, what Adam Smith in 1776 called, “the wealth of nations”, or what today is called “national income” that results from the actions of relatively tangible agents such as capital, labor and natural resources as well as more intangibles ones including entrepreneurship and technological change. Thus until the late 18th century, national wealth increased, it was thought by the Mercantilist School of economics, by acquiring more and more ‘capital’ in the form of gold, silver and land (including chattel [‘moveable property’] which comes from the Anglo-Saxon word for ‘cattle’) as well as more slaves, serfs, peons, habitant and other human beings effectively ‘owned’ by a nation. By the mid-19th century the concept expanded with the Classical School to include manufacturing plant and equipment combined with division and specialization of labor. By the last quarter of 19th century, it grew further with the Neoclassical School to embrace large-scale financial capital (especially limited liability equity markets), increasingly organized labor and ‘disembodied’ technological change referring to general or systemic ‘progress’ in fields like transportation, manufacturing and communications. With the Keynesian School of the mid-20th century it expanded to encompass the role of government in managing the wealth of nations as well as ‘embodied’ technological change referring to the specific marketable results of organized research and development in the natural and engineering sciences, e.g. the transistor in the transistor radio. Today our conception increasingly focuses on intellectual property including formal rights such as copyrights, patents, registered industrial designs and trademarks as well as informal rights including ‘know-how’ and trade secrets constituting what I call ‘the quaternary sector’ of the economy complementing the three standard sectors: primary (agriculture, farming, fishing and forestry); secondary (manufacturing); and tertiary (services). And with this development we have entered the ‘knowledge-based economy’. It is important to note that this economic evolution has been paralleled, if not propeled, by legal evolution defining ever more intangible forms of property rights (please see J.R. Commons, The Legal Foundations of Capitalism). The success of this new economy depends particularly on two factors of production and their interaction – entrepreneurship and technological change. Entrepreneurship is, compared to fixed plant and equipment, workers and raw materials, a very ill-defined, intangible factor of production. The word ‘entrepreneur’ comes from the French entreprendre which can be translated alternatively as: (a) “undertaking” as the person in effective control of a commercial undertaking; or, (b) “middling” as a contractor acting as an intermediary. Undertaking responsibility for a commercial venture or middling between producers and consumers involves risk. The willingness to undertake such risks are what John Maynard Keynes (p. 161) called the “animal spirits”. Since the time of John D. Rockefeller Senior and the “Robber Barons” the business tycoon, the man (and increasingly the woman) whose vision is ultimately realized in economic space, has been an icon of both ‘democratic’ and economic thinking. Today the entrepreneur formerly known as “Bill Gates” bestrides the globe opening and closing windows unto the future. Thirty years ago he was a ‘nobody’, today this sometimes “richest man” in the world wrestles with his co-patriot, Sam Robson Walton founder of Wal-Mart, for the title. But it is no longer just ‘captains of industry’ who are ‘risk-takers’ for we have become an entrepreneurial society in which a near majority risk financial capital, indirectly through RRSPs, company retirement and ‘stock option’ plans (whose value is based on the market value of a company’s stock) and mutual funds, or directly through equity ownership bought and sold on the stock market. The waxing and waning of the animal spirits of investors and entrepreneurs, measured by investment in real and financial capital, is a major cause of the so-called business cycle. The recent ‘dot.com bubble’ is an example of the impact of animal spirits, the sense of risk-taking, that fuels the capitalist economy. Thus behind all of the equations and ‘rational’ economic models lays sheathing passion, greed and fear summed up in Keynes’ term ‘animal spirits’. Keynes’s whole theory of unemployment is ultimately the simple statement that rational expectation being unattainable, we substitute for it first one and then another kind of irrational expectation: and the shift from one arbitrary basis to another gives us from time to time a moment of truth, when our artificial confidence is for the time being dissolved, and we, as business men are afraid to invest, and so fail to provide enough demand to match our society’s desire to produce. Keynes in the General Theory attempted a rational theory of a field of conduct which by the nature of its terms could be only semi-rational. The other key factor is technological change or what Joseph Schumpeter called ‘creative destruction’. The contribution of technological change to growth in national income has been estimated as high 66% (Shapiro, p. 493). However, we have no idea of why somethings are invented while others are not, and why somethings invented are innovated (brought to market) and others are not. In this sense, the contribution of technological change to national income can be called the ‘measure of our economic ignorance’. It is important to note the two stages nature of this ignorance – invention and innovation. While invention appears to be a matter of realizing a natural science potential, innovation is a matter of social or cultural factors. For example, the electric battery was apparently invented more than 2,000 years ago outside what is now <?xml:namespace prefix = st1 ns = "urn:schemas-microsoft-com:office:smarttags" />Baghdad. The so-called ‘Baghdad battery’ did not result in any significant economic growth or development, not for technical but for socio-cultural reasons. In pre-modern time, the art of turning lead into gold was called alchemy from which modern chemistry evolved. Today the art of turning an idea into a profitable good, process or service can, by analogy, be called “psychic alchemy”. And who are the most successful alchemists of our age? As a student I was told that: “An economist is a tool bearing animal but the tool box is in his head”. And what are the tools? Concepts! In this regard the word ‘concept’ derives from the Latin capere “to take”, and was originally used in the sense ‘to grasp firmly with the hand” or in Sicilian, “to steal”. So let’s take an inventory of what tools you should be carrying, given the prerequisites for this course. From your introductory and intermediary microeconomics courses you should have a working knowledge of: elasticity, equilibrium, externalities, marginal and opportunity cost, supply (producer theory), demand (consumer theory) and markets (competition theory). From introductory macroeconomics you should know something about aggregate demand and supply, comparative advantage, expectations, marginal propensity, money and the multiplier – all in the Keynesian tradition. To this point these are just a loose collection of tools you have ‘learned’ about. In this course they will be put to work; some new ones will be added; and skill in using them assessed. Some of you will take them further, refining and polishing their use, even creating new ones, through a career in economics; but for all, however, you should come away with a sound grounding in, and understanding of, the major economic theories guiding a post-modern world striving for higher and higher levels of national income, and, hopefully, higher and more equitably distributed global income together with a better, more fulfilling way of life for all citizens of planet Earth. We will take these tools and use them to construct and then operate the three primary engines of macroeconomic analysis – Classical, Keynesian and Monetarist. We will then tinker with these ‘standard’ engines to construct mixed or hybrid engines. We will then ‘road test’ them on the fiscal, monetary and growth policy highway system of national macroeconomic policy. However, not only will these engines be tested, your driving ability will also be assessed and rated. To help you along the way the website provides some pit stops that may prove helpful. The Glossary of the text is provided on-line. Various ‘in-depth’ articles and extracts are provided so you more easily immerse yourself in economic thinking and gain a somewhat different perspective from that presented in the text book. Finally all my lecture notes will be available on-line and will include links to relevant graphics and other teaching aids.